Samsung just started their big Media Hub event in NYC and minutes before dropped a presser for the Samsung Tab. It will definitely be landing on all 4 carriers including Verizon. Oh, and there is already talk of a wi-fi only version. Stay tuned! Longest press release in history after the break. DALLAS, September 16, 2010 -Samsung Telecommunications America (Samsung Mobile)1, the No. 1 mobile phone provider in the U.S., today announced the upcoming availability of the Galaxy Tab™ in the U.S with AT&T, Sprint, T-Mobile and Verizon Wireless. The first mobile tablet from Samsung shares many of the powerful characteristics of the Galaxy S smart phone lineup that launched this summer. 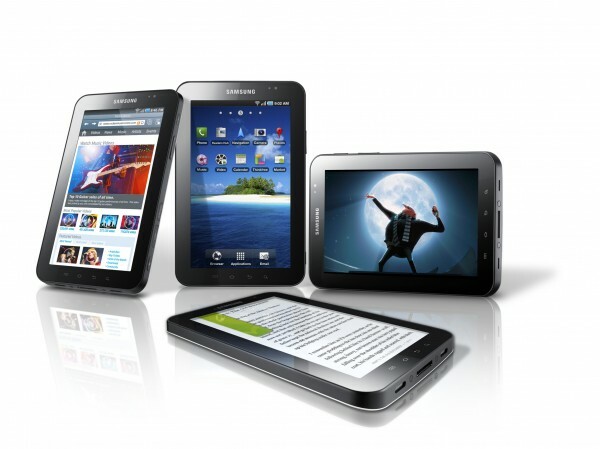 The Galaxy Tab is designed with several enhancements to create a unique mobile experience that other products can’t deliver. The Galaxy Tab features a brilliant 7-inch enhanced TFT display screen, 1GHz Hummingbird Application processor supporting 3D graphics and smooth Web browsing and front and rear-facing cameras for video chat while on-the-go. The Galaxy Tab is powered by Android 2.2™, including full support for Adobe® Flash® Player 10.1. Just like the Galaxy S smart phones, the Galaxy Tab includes Samsung’s Social Hub application and the new Media Hub content service, offering a robust collection of premium movies and TV episodes from some of the biggest entertainment companies. In addition, the Galaxy Tab will include future access to Media Hub, Samsung’s own content service, offering a vast lineup of critically acclaimed films and TV programs for rent or purchase. Samsung is working with the biggest and best names in entertainment, including MTV Networks, NBC, Paramount and Universal Studios Home Entertainment to assemble a full library of movies and TV programming, including new release films, next day TV episodes and even full TV show seasons. Media Hub also allows the user to expand the entertainment experience, allowing content purchased to permanently own to be shared with up to five devices that carry the Media Hub application. Red DROID Incredible, Better than White?